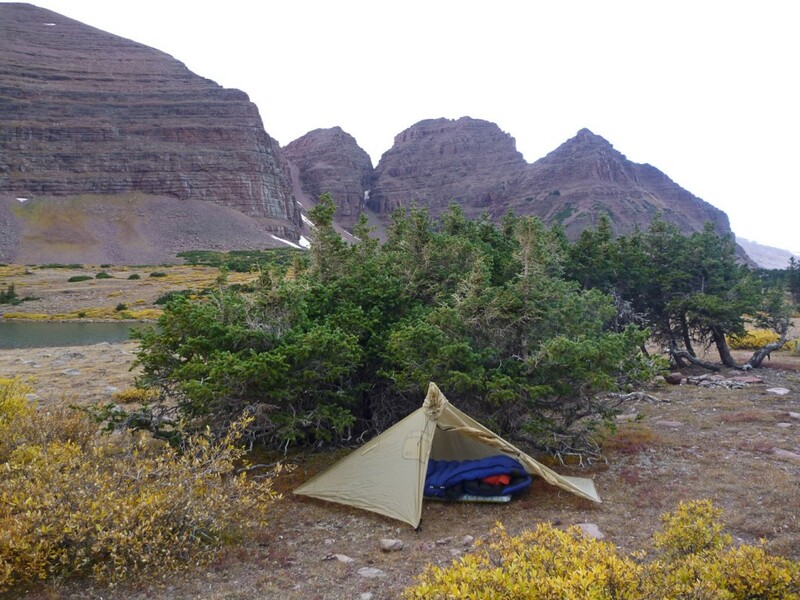 The Echo II from Hyperlite Mountain Gear is my latest backcountry shelter. It’s a hybrid tarp/tent made mostly from lighweight Cuben fiber material. I’ve been using the Hyperlite Mountain Gear Echo II shelter for a couple of months now. I’ve slept in it for about 10 nights. Not enough time for a long term test, but enough to have a pretty good feel for the qualities and limitations of this tent. Durability so far has been very good. I haven’t poked any holes in it or otherwise damaged it. Signs of wear are minimal. Set up requires two trekking poles and 12 stakes. That’s a lot of stakes compared with your typical free standing tent, but the overall weight of the Echo II is light enough that it doesn’t really matter. Set up is relatively simple, particularly because I generally keep the inner net tent already hooked up to the tarp, which speeds assembly. Unlike a typical pyramid tarp, there’s a fair amount of lattitude with where you position the stakes. So, if there’s a rock that prevents pounding a stake in where you put it initially, you can just place the stake a bit closer or nearer and add or take in slack by means of the guyline and tensioner. As long as the stake is at the correct angle, the exact distance to the tarp is not critical. I’ve found that the easiest way for me to erect the tent is to stake out the tarp first, then insert the trekking poles, then re-position and re-tension the stakes as necessary. Getting the tent up in a high wind can be a bit of a challenge when working alone. With two people working together, it’s not too bad. The adjustable cord tensioners used to adjust the length of the guylines are simple to use and they don’t slip. Living space is adequate for two people. For one person, the Echo II is very spacious. The “beak” vestibule provides adequate covered protection for shoes, backpack, etc. The netting inner tent is attached to the outer tarp in such a way as to maximize interior space and minimize drooping. I have only used the Echo II in summer conditions, although these were mountain summer conditions, which included a fair amount heavy rain, some sleet, and moderate winds. I stayed completely dry throughout heavy rain, including one storm where it rained heavily for about 5 hours, accompanied by gusty winds. I have not experienced really really high winds in the Echo II, but given the number of stakes holding it down, I’m optimistic that it would do at least as well as other lightweight tents I’ve used. If I were expecting very heavy winds, I would pitch the tarp low to the ground to minimize wind getting underneath the tent as much as possible. Condensation with the Echo II is minimal. The ventilation afforded by the tarp design and all the netting fabric on the interior has meant that I haven’t really encountered any condensation issues at all. One of the great things about Cuben fiber fabric (other than its light weight) is the fact that it doesn’t stretch out when it gets wet. Syl nylon fabric tends to stretch quite a bit, which means that you need to re-tension a syl-nylon tent regularly, especially when it’s raining. The Echo II, however, doesn’t have any stretch at all to the cuben fiber fabric, which is great, because a heavy rain is the time when you least feel like messing around with tensioning your tent guylines. 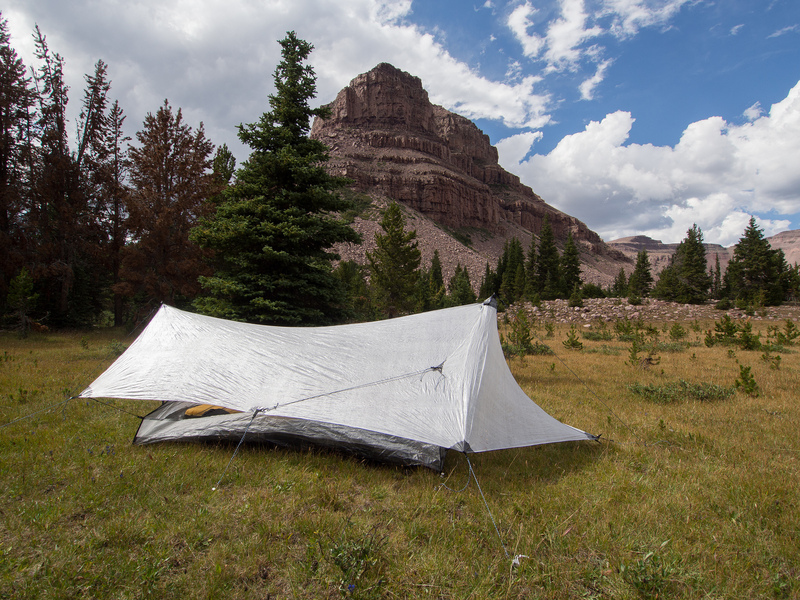 With the Echo II, you get the tent nice and taut when you pitch it, and then it stays nice and taut all night long. One of the limitations of Cuben fiber is that it tends to be kind of bulky. I think that this additional bulk is due primarily to the fact that Cuben fiber fabric has a fair amount of “memory” so it tends to keep its shape more than syl nylon or other lightweight fabrics. This leads to additional bulk. However, you can minimize this bulk by compressing the tent like you would a sleeping bag. I fold the tent up, put it in the stuff sack, and then I sit on the tent for a minute or so, squashing it flat. Sitting on the tent reduces the volume by about half, and because of the “memory” of the fabric, once compressed, it doesn’t really bulk up again, but rather stays flattened, taking up much less pack space. Overall, the Echo II is the best 3 season shelter I’ve used. There are some that are lighter. A floorless pyramid tarp, for example, is lighter than the Echo II. However, with a floorless pyramid, you sacrifice bug-resistance, and you give up the wet weather comfort of having a floor on the tent. I tend to get significant condensation in most of the pyramid designs I’ve used too. For me, the Echo II strikes the perfect balance between light weight, protection, and comfort. For three season camping, it is my new favorite tent. Note: Hyperlite Mountain Gear has made me one of their “Ambassadors.” I don’t get paid for this, but I do occasionally get prototype gear to test, and occasionally can buy gear at discounted prices. The Echo II, however, I paid full retail price for. I had the opportunity to test out a couple of pieces of lightweight backpacking gear, the Evernew TiDX Stove kit, and the Six Moons Designs Gatewood Cape. I took them both up in the High Uintas Wilderness for a 40 mile hike. Days were cool, nights below freezing. I experienced wind, snow, and sleet. 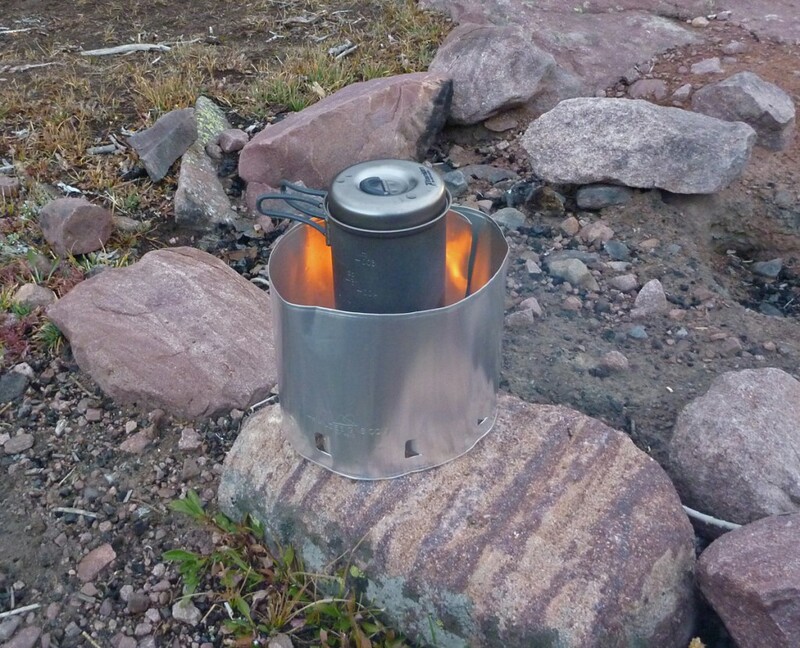 The Ti DX is an integrated stove kit consisting of a titanium alcohol burner and a pot support that also acts as a windscreen and fire burning grate. This kit is designed to ulilize the alcohol burner and also will burn wood. The Evernew alcohol burner is very similar in design to the classic Trangia alcohol burner. 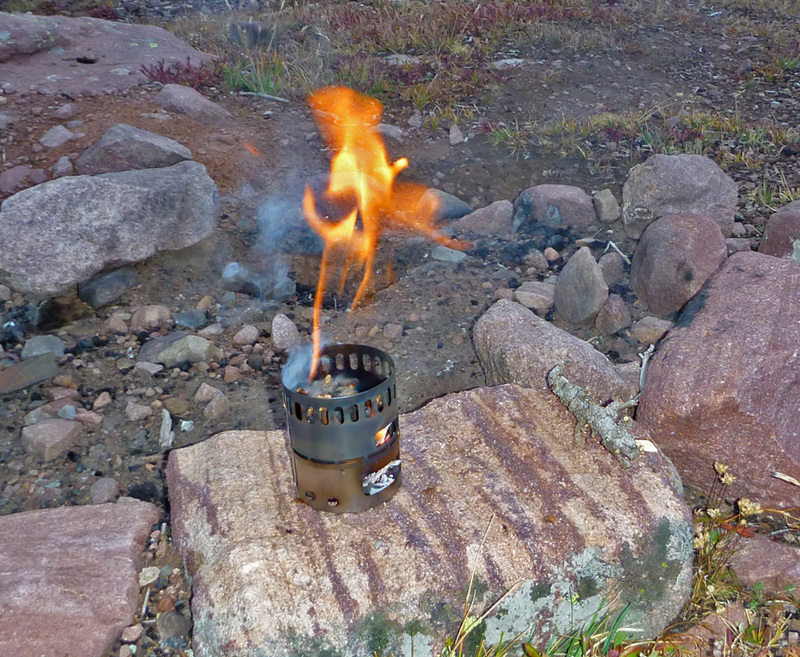 The TiDX stove kit nests perfectly inside of an Evernew 640ml tall pot, which is what I used for my trip. The Evernew set is quite light weight. Weight is 3.2 ounces for the stove kit, and 5.4 ounces for the pot set (640ml pot nested inside of 400ml cup) and small pack towel. I used a heavy foil windscreen in addition to the stove kit. In breezy conditions, I found the foil windscreen to be essential for efficient cooking. After some use, my conclusion is that this stove kit works quite well with the alcohol burner, but it’s wood burning performance is sub par. Using the alcohol burner, the stove had no troubles bringing my 600ml of water to a boil. I didn’t keep careful track of times, but the times seemed to be around 5 minutes or so. There’s no built-in method of putting the stove out when you’re finished cooking, so I just used the pot or the cup to cover it and snuff it out. Ultimately, while the Evernew is a nicely designed piece of kit and is very light and compact, I think I prefer the Caldera Cone Ti-Tri. Alcohol burning performance is similar, and the Ti-Tri has much superior wood burning performance. However, I really do like the Evernew titanium alcohol burner, and I’m going to use it as my burner for my Ti-Tri kit going forward. The Gatewood Cape is a combination poncho and shelter. You can wear it like a poncho when you are hiking, and then, using a trekking pole and some stakes, you can turn it into a one-person shelter for the night. I was quite impressed with the Gatewood Cape when used as a shelter. It is pretty easy to set up, pitches nice and taut, and it kept me dry and protected from wind, rain, sleet, and light snow. I didn’t encounter any leaks or other problems. Interior space is adequate for a person along with some additional gear. In poncho mode, the Gatewood Cape is less impressive. Like most ponchos, it’s not great in high winds, and there really isn’t any good way to keep it from getting blown around. It is roomy, however, and there’s decent ventilation. It covers your pack too, so it keeps your pack dry when it’s raining. However, while it isn’t as great as a dedicated rain suit, it only weighs 11 ounces, which is pretty impressive. Overall, I think it’s a pretty good solution for a combination shelter and raingear at a very light weight. However, while I don’t really have any substantive complaints about the Gatewood Cape’s performance, I found that a single combination of shelter and raingear doesn’t fit my style of backpacking all that well. Typically, I get up early, hike until the afternoon, set up camp, then go off to fish or explore. However, once I set up my camp and erect my shelter, I don’t have raingear to wear any more. I like to take raingear along when I leave camp to go fishing, to protect me from the inevitable afternoon mountain storms. Also, the cape when worn as raingear isn’t very good for fishing in. It’s too bulky and billowy. So, for a fast and light approach, I think the Gatewood Cape is brilliant, but for my more relaxed approach, I think I’m better off not combining shelter and rain coat. That doesn’t mean that I won’t use the Gatewood Cape, however, It’s good enough as a shelter, that I could see myself bringing it along as a lightweight shelter even if I am not intending to use it as a poncho. Here’s a Link to youtube video of Gatewood Cape test. that I filmed during a backpacking trip.